The ice could not melt from the entire mentos surface all at once. It probably couldn’t react fast enough to fizz over. That’s not why it doesn’t work… the ice smoothens the surface of the mentos and the bubbles are just not produced anymore. You have to make spoogecubes to hide the mentos, and most people won’t let you put them in their drinks. 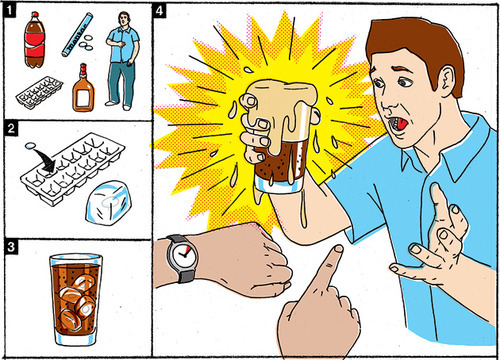 The real reason its doesn’t work is because no one would be dumb enough not to notice a mentos in an ice cube. I thought this only worked with DIET coke. In which case the picture is either wrong or else that’s a very poor rendering of a chubby college girl. What, you think only chubby college girls drink diet coke? I rather prefer the taste of diet soft drinks over regular. But do you also use it as a mixer? I think not. Look at step 1 again.